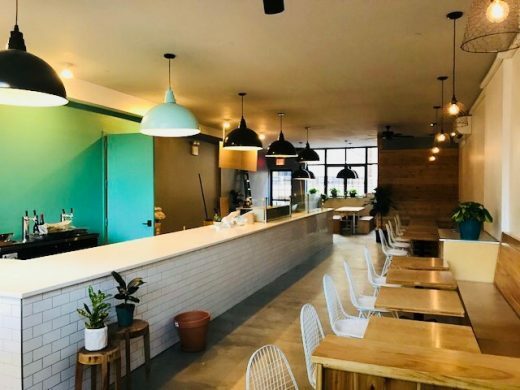 Those seeking a healthier bite to eat near the JMZ trains can now get their fill at Leaf, a new restaurant on Myrtle Avenue offering salads, rice and quinoa bowls, coffee, beer, and wine. 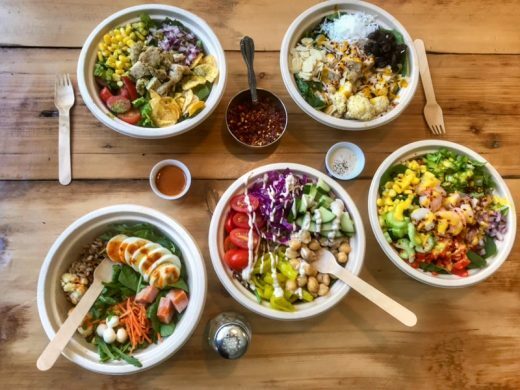 In addition to health (they cook their meats and vegetables in an oven using minimal oil, they say), Leaf also prioritizes locally-sourced items, though they admit it’s not always financially or logistically feasible to get everything local all the time. Produce isn’t the only thing at Leaf that’s local. Their coffee comes from Irving Farms, which has a roastery in the Hudson Valley, and their beer comes from Brooklyn-based breweries like Other Half. Their current wine selections predominantly hail from France, an area that’s historically conscious of details like the quality of soil their grapes are planted in. “We try to stick with whole foods, wild rice, organic… Basically everything that we would eat, we try to serve people here,” adds Culjak, whose Bulgarian heritage inspired some of the menu offerings, such as the inclusion of Bulgarian feta cheese and high-quality black olives. Munoz is from Ecuador, and is working on options like chimichurri steak and a bowl with plantains, avocado, rice, and beans. They also make their dressings in-house, focusing on options without sugar, cream, or mayonnaise. Some of their future plans include soups in the winter and a weekend brunch with familiar favorites like eggs, avocado toast, and oatmeal. A similarly health-focused spot, The Salad Wheel, did previously exist nearby at 9 Jefferson Street, but closed its doors in 2014. Reporting from Bushwick Daily notes that Munoz was an investor in Salad Wheel and took over the space upon its closing. There, she opened La Lupe, a Mexican taqueria inspired by her mother, in 2015. On July 13, Patch reported La Lupe had been closed by the health department due to violations (which the restaurant confirmed on Facebook), but has since reopened. 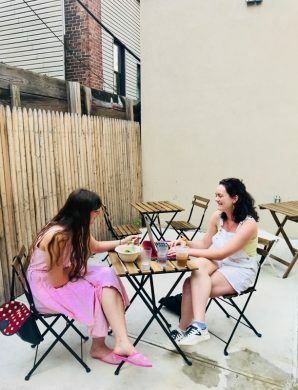 Though the team now already operates two restaurants in the Myrtle-Broadway area, they’re not done yet: at the end of July they also opened Bodeguita, a “Cuban inspired mixology cantina with live music and small plates” located at 6 Suydam Street. It’s always good to have more options when the L train shutdown (and subsequent overcrowding in other train lines, especially the JMZ) inevitably makes people stay in their neighborhood unless they absolutely need to leave. “It’s Bushwick, the people are relaxed and just chill. They make it easier to run a business than an uptight place somewhere in Manhattan, I don’t know. But being in Bushwick, it’s different,” says Munoz. Leaf is located at 1161 Myrtle Avenue between Troutman and Jefferson Streets, and is open from 11:30 am to 9:30 pm. « Residents Say City Sold Former LES Nursing Facility ‘Like a Bag of Dope’	» People Are Psyched About a Sephora Store On Bedford? It Doesn’t Make Scents!